Recently I went to see the new Pirates of the Carribean movie with my sister. Johnny Depp makes me laugh! I guess that jogged my memory of a cool photo Tracey sent me when she was in California last year. I believe she said she thought I might like the challenge. This was a guy who ran a booth at a festival that sold dog wear, leashes and bandanas and such. …and, yes, Tracey, challenging it was. I revisited hot press paper again as I am trying to get the feel of painting on this surface. Below are some steps in my process for those of you who like to see that. No special techniques other than the use of some frisket in a few places. I prepared a line drawing, first. I used that cross hair acrylic grid that I spoke of in a previous post here. This helped me visualise the placement of the two figures and their shapes. 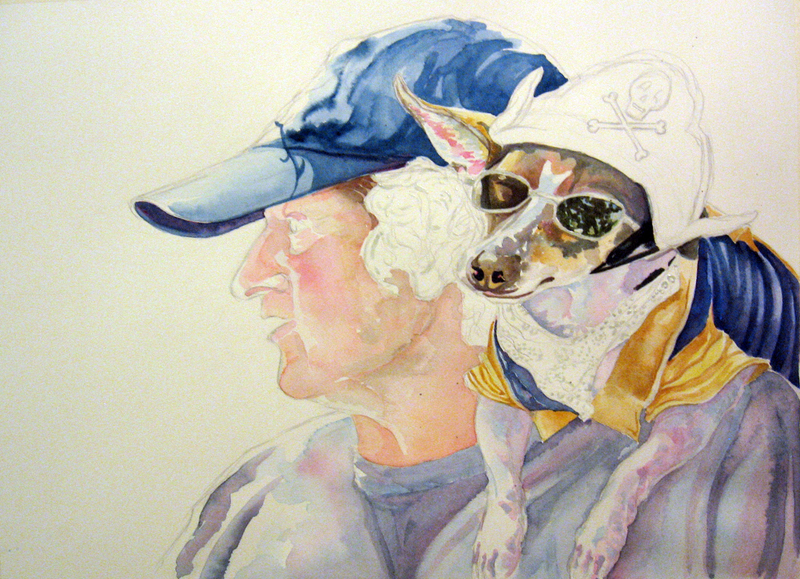 I started the painting with the blue cap and the blanket on the dog. I think I did this to get a sense of the values I needed. I usually do not begin with darks. 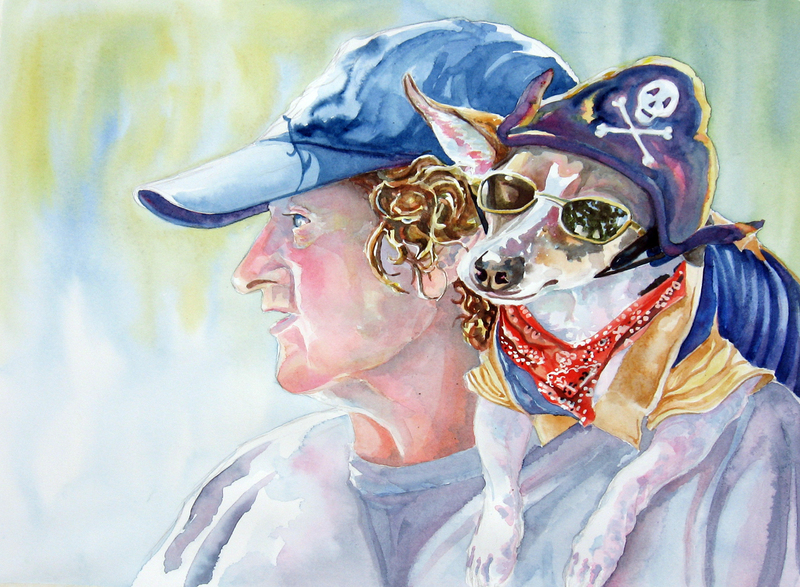 Next, I worked on the dog because I knew I wanted him to dominate the scene and the guy just back him up. I wet the entire surface of the background and ran two of the colors I had used in the portrait from top to bottom by applying the pigment onto the wet surface at the top of the paper and tilting it so it would run down the page. If any of the pigment ran onto the figures, I dabbed them off with a paper towel. 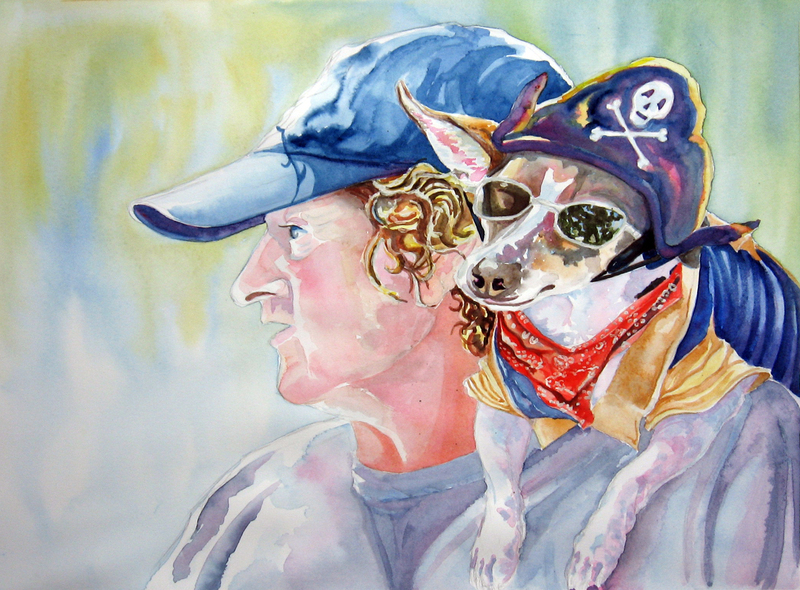 I painted in the bandana, guy’s hair, and removed the frisket around the dog’s glasses, bandana, tip of nose and guy’s hair. I finished the painting by softening and defining the areas that had frisket applied. I also had to work with adding some darks to the man’s skin tones. 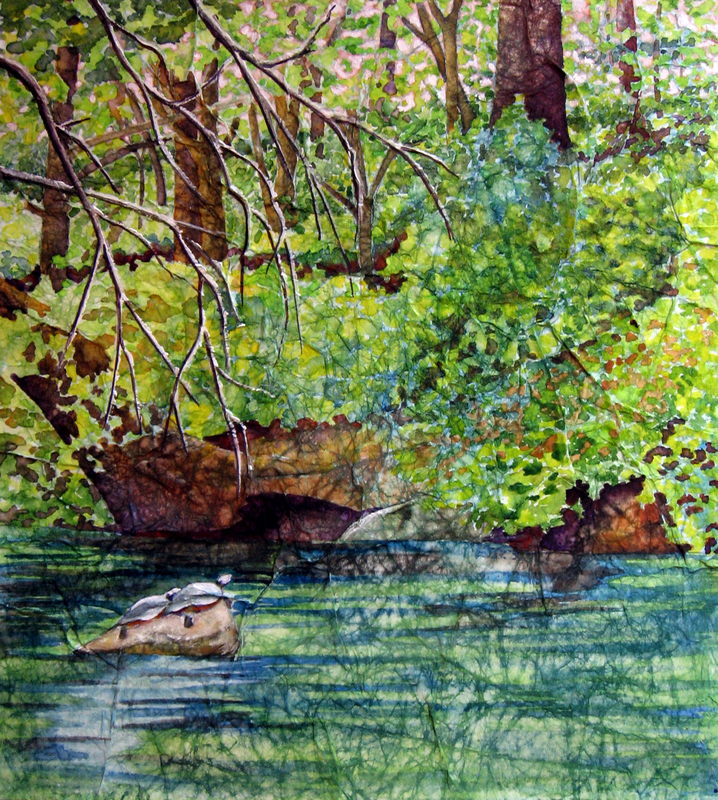 This painting was painted on toned masa paper and is my contribution to Linda Halcomb’s End of Spring Challenge. She asked that we paint something inspired by the line “leaping greenly spirit of trees” from an e. e. cummings poem. If you would like to see what other artists have created click here, and everyone participating will be leaving their link to their contribution in the comment section. 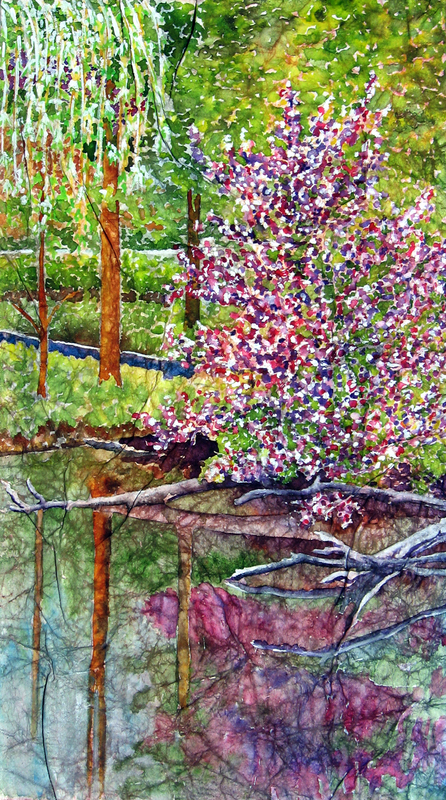 This is inspired by a photo taken a year ago spring on a small manmade lake where my sister lives in Indianapolis, Indiana. I was struck by the contrast of the flowering tree in the foreground against all that spring greenery. We were sitting in a little paddle boat meandering along the shoreline of this little lake at the time I took the photo. I chose a toned piece of masa paper for this painting. I was surprised it came out so well as the base tones of the paper were yellows and oranges. She encourages artists, photographers and writers to participate! Just create something to the theme: “the leaping greenly spirits of trees” inspired by a line from an e. e. cummings poem here. Then, on the morning of the 20th, comment on her post that day calling for links and leave a comment on her post with your link to your post. It was quite fun when we did this last year and shared all our different styles and ideas. Thank you, Linda, for a great challenge! 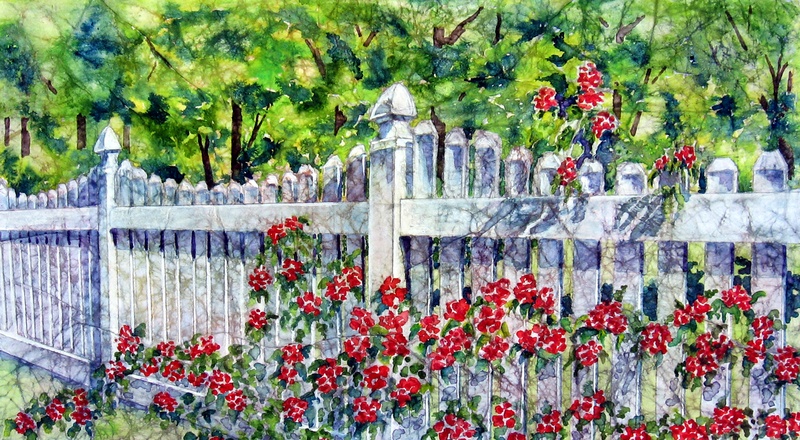 The above painting is my picket fence in my backyard. This is last year’s roses. This year’s roses are blooming right now. Sadly, due to the hard and extremely cold winter, there aren’t as many. However, they are beautiful as ever. This was painted on masa paper. I enjoy working on landscapes that have a man made object in them. I guess I like the contrast.